ISO 14001 accreditation marks culmination in series of environmental commitments. Superglass has always had excellent environmental credentials – up to 84% of our raw material is recycled glass, after all. And further evidence of our ‘green’ commitment has been our accreditation of ISO 14001:2015 – Environmental Management System for our production processes. An international manufacturing standard that’s independently assessed and awarded only by meeting strict criteria, ISO 14001:2015 marks the final stage of the total upgrading of our manufacturing facilities over several years. Accreditation was also one of the commitments we made in our recently signed Sustainable Growth Agreement. 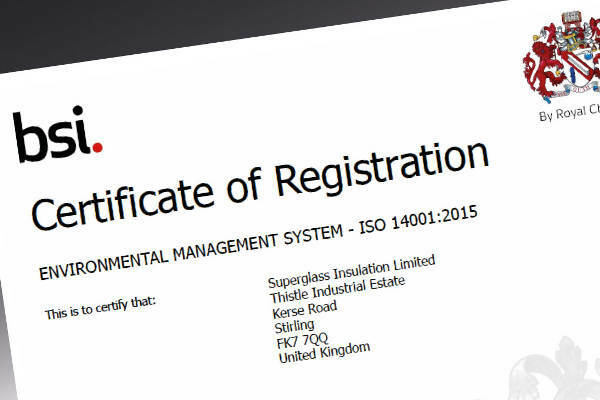 By demonstrating that we have a comprehensive environmental management system in place, it acts as reassurance to both staff and customers that our environmental impact is being constantly monitored and improved – and helps promote our long-term message of Superglass being the superior choice. Download a copy of the certificate here.